During the last Salon du Livre de Montreuil (the Paris Children's Literature Show, occurred Novenber 25th to 30th) I had the chance to find several very interesting, newly published, books. The Salon is always cause of artistic dazzling discoveries, it was in fact during the 2008 Salon that I was literally enchanted by the genius of an eclectic French author: Mr Benoît Jacques. 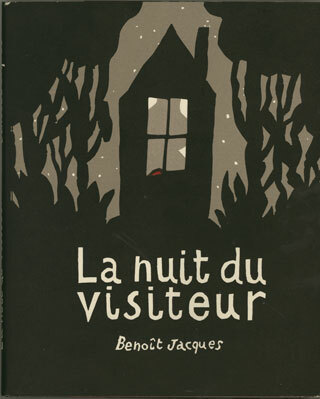 When I saw La Nuit du Visiteur, I was speechless: it's a brilliant book, not just for the absolutely original reinterpretation of 'Little Red Riding Hood', or for the essential and effective use of color and graphics that contribute to increase the story's pathos, but for the whole of this masterpiece that I consider one of the best children's books of the last few years. It is not by chance if, during the 2008 Salon, the book won the prestigious Prix Baobab, and it is not by chance if the Publishing House Orecchio Acerbo immediately seized the opportunity and published the book in Italian last May, with the title Aprite quella Porta! (Open that door!). I take this chance to personally thank the people at Orecchio Acerbo as they gave Italian readers the chance not to loose such a wonderful book. Here is the link to the video regarding the prize-giving to B. Jacques: a very touching moment, where the author (and publisher) tells about his dream and the hard work he's getting ahead with commitment and effort. 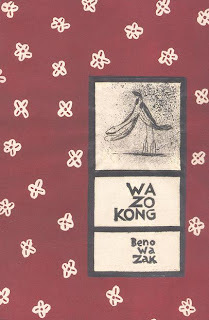 Today I am happy to announce the publication, during the 2009 Salon, of a new Benoît Jacques book titled Wa Zo Kong: the tragic and unique story of a "Wa Zo ki vo lpah... y Kou"... 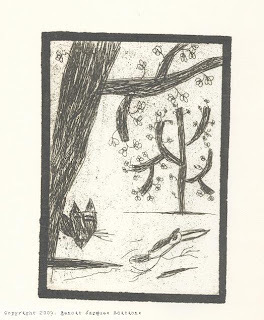 I shall not tell you more than this: it's the story of a Wa Zo (oiseau, bird) and of his inability to fly. Illustrations are in black and white, essentials though warm and engaging. It's a very amusing book, with that biting and disenchanted irony in the typical Jacques style that leads readers to smile and, at the same time, to think over human routes. In the simplicity of this text and images, the animal world seems to be more of an excuse that the real subject of the book: much more subtle lines on human behaviors, on modern society and it's mechanisms, on the so said rules that dominate our acting, are hiding behind what is not said. It seems that Mr. Jacques wanted to suggest us a new perspective leading us to reflect, to open up our minds to free thinking. With the hope that the dream Mr Jacques had when he was a child, and that he translated into his publishing adventure, may keep going for a long time, to our advantage as well, as I don't want stop believing that everybody is free to tell what they think and to represent it regardless of lobbies of any kind may them be in the publishing business, cultural or political. Thank you Mr Jacques! Wa Zo Kong by Benoît Jacques, Benoît Jacques Books, November 2009. Images Copyright: Benoît Jacques. Images reproduced with the permission of the Benoît Jacques Publishing House.